Georges Demarées’ father was French while his mother was from a family of artists from the Low Countries. 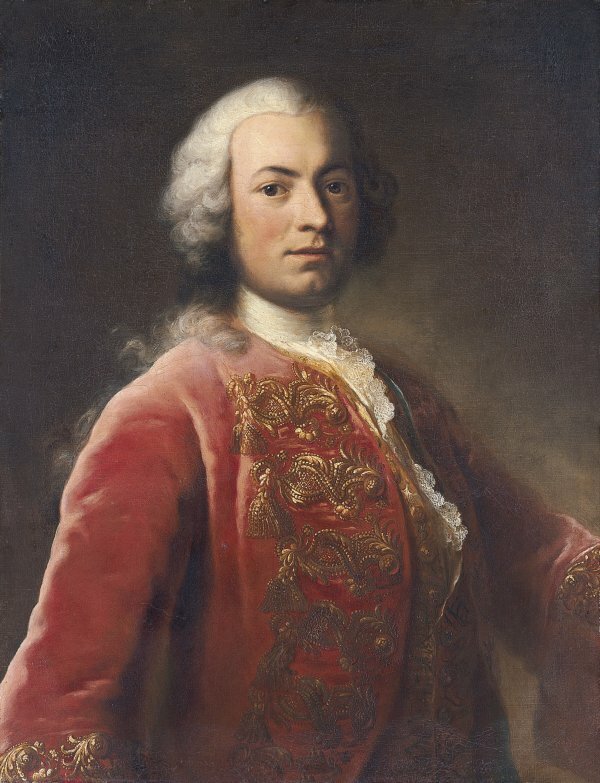 As an adult he lived and work in Germany but began in his training in Stockholm in the studio of his uncle Martin van Mytens II, continuing his studies for a brief period in Amsterdam, at the Akademie der Bildenden Künste in Nuremberg with Daniel Preissler, and then in Venice in the studio of Giovanni Battista Piazzetta, who influenced his technique. During his years of study Demarées was also interested in the work of French painters such as Hyacinth Rigaud and Nicolas de Largillière. In 1730 he is documented in Munich where he was summoned by the Elector, while one year later he was working for the Prince-Bishop Clement Augustus of Cologne and for the Landgrave William III of Hesse-Kassel. Demarées is noted for his excellent portraits, a genre that he explored in his early years while in the studio of his uncle Van Mytens II. He is also considered one of the most important German Rococo painters and his settings, colours and figure types follow the international precepts of that trend. Together with his large-scale formal portraits in which sitters of elevated social rank and position are depicted with the symbols of their wealth and power, Demarées also painted more simple images of middle-class and aristocratic Germans. This pair of portraits is a fine example of the latter type. According to old catalogues of the Collection these canvases remained with the descendents of the sitters. They were both in the Rohoncz collection in 1930 and were included in the exhibition at the Neue Pinakothek in Munich that year when this major private collection was first made known to the general public. From then on they were included in the successive editions of the Collection’s catalogues with brief entries by Rudolf Heinemann. These entries record the inscription on the reverse that states the names of the couple and the date of the paintings’ execution in 1750, a period at which Demarées was working in a markedly Rococo style. The couple are depicted in a traditional manner with the woman presented more frontally, particularly her face. The artist used a continuous dark background across the two canvases that seems to be an exterior to judge from the dense branches behind the woman. The background is painted in a free manner with highly diluted pigment that creates a soft, undefined effect and contrasts with the tone and texture of the figures. Demarées drew the faces with precision and accuracy, lightening his brushstroke for the fashionable clothes, which are much more freely painted. He achieved fine effects of textures in the woman’s light dress, combining blue and pink tones that harmonise with the white lace of the left sleeve on which the highlights are depicted with large brushstrokes. The wife looks out at the viewer, holding up a jewel that she holds carefully in the folds of her shawl, while the presentation of the husband focuses on the fine details of the gold embroidery on the pink velvet frockcoat and on the waistcoat that he wears for the occasion. Go to Portrait of Maria Rosa Walburga von Soyer.